Öresundskraft is one of Sweden's largest energy companies with about 400 employees. The company is owned by the city of Helsingborg. The core business is the sale and distribution of energy (electricity, district heating, natural gas and cooling), and the sale of broadband and vehicle fuel. The company has its own production of heat and electricity in three power plants. Öresundskraft own the Helsingborg city network. Biogas, CNG, LPG, natural gas and hydrogen are so-called energy gases. The gases are efficient and have a wide range of applications. They can replace oil and coal in industrial applications, in heat and power production, and in shipping and road traffic. Liquefied biogas (LBG) consists of cooled and liquefied methane. Biogas condenses at a temperature of C -162 ° and contains more energy per unit volume than biogas in gaseous form - 1.7 liters of LNG equivalent to 1 liter of diesel. This is why LBG and LNG can be shipped more efficiently and contribute to solving the logistics and distribution problems that gaseous biogas has today. CNG stands for Compressed Natural Gas and consists of a fossil fuel (natural gas) compressed to less than one percent of its original volume. LBG gas consists mostly of methane. 5 liters of CNG is equivalent to 1 liter of diesel. 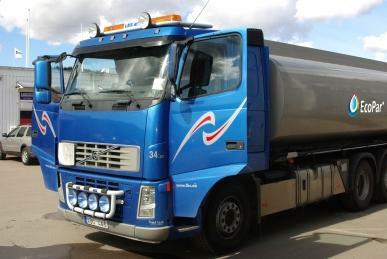 In December 2014, Helsingborg opened a cold gas filling station for liquefied biogas (LBG) and compressed natural gas (CNG) to serve heavy trucks. These renewable gases are starting to compete with more traditional diesel fuel. A revolution has begun. Environmentally conscious shippers, trucking companies, truck manufacturers, and other companies are spearheading the development and distribution of liquid biogas. In Helsingborg, this includes ICA, Volvo, Cryo AGA, Processkontroll, Preem and BSS; and trucking companies like HVF, DSV, Viebkes and Tommy Nordberghs. “The new filling station is operated by Öresundskraft and represents an investment of more than SEK 30 million,” says Magnus Extergren, project manager for the filling station. “The station is located in VERA Park, an industrial complex, adjacent to the municipal waste company NSR’s plant on the outskirts of Helsingborg. The station has separate pumps for light and heavy vehicles. 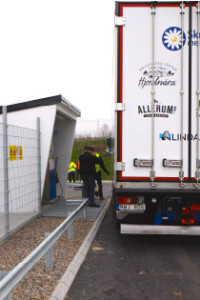 The location near the E6 makes it possible for a truck to run on biogas from southern Sweden to the Mälardalen region, almost half the length of Sweden,” continues Extergren. Biogas offers the lowest emissions of carbon dioxide, particulates and nitrogen oxides compared to other fuels. Carbon dioxide emissions can be reduced by 90 percent compared to diesel. ICA, with a cargo terminal in Helsingborg, is an important catalyst for the use of liquid biogas. The terminal accommodates up to 500 trucks a day making it one of ICA’s largest. In a couple of years, it will serve 1,000 trucks per day. “ICA’s environmental goal is to reduce carbon emissions by 30 percent in real terms from 2006 to 2020. 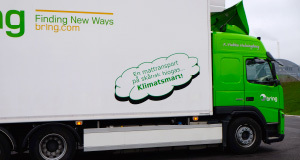 Here in Helsingborg, we were the first to introduce maximum emissions in our contracts with shippers. A cold gas filling station is a prerequisite for this goal and very welcome,” says Marcus Gustafsson, business developer for ICA Sweden AB. Liquid gas requires tanks and engines adapted to the new technology. Part of the company’s business strategy is to work with Volvo Trucks to promote the introduction of liquefied natural gas and biogas as a viable fuel for commercial heavy trucks. Volvo’s methane-diesel concept makes it possible to use liquid gas in diesel engines for long-distance transport. Volvo’s FM methane-diesel engines are equipped with new technology that uses liquid gas as the main fuel. The truck engine is already available in Sweden, the Netherlands and the UK and is being introduced in Spain, Italy, Germany, Belgium and France. 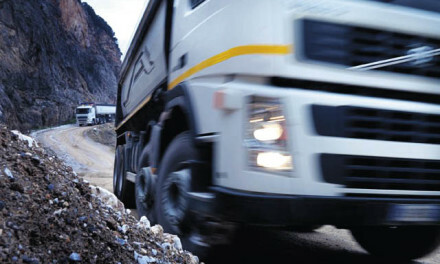 Volvo FM methane-diesel engines are used in vehicles with a total weight of 40-60 tons. Diesel fuel is used to ignite the LNG. 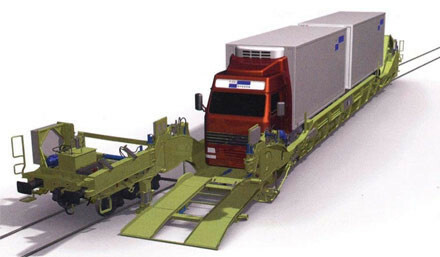 The proportions are up to 75 percent gas and 25 percent diesel, depending on the type of transport and driving cycle. The pressurized gas tank stores the gas at a temperature between C °-130 and – C 140 ° to keep it liquid. Data from Volvo indicates reduced carbon dioxide emissions of 10,000 tons of LNG and 40,000 tons of LBG during the lifecycle of 50 trucks. Nordvästra Skånes Renhållningsbolag (NSR) produces biogas by anaerobic digestion of organic waste from households and businesses and is located close to the new refueling station. In 2013, the biogas plant’s capacity was doubled. Approximately 9 million liters of fossil fuel (petrol) per year can now be replaced by biogas. The plant is one of the nation’s largest for co-digestion of food waste and manure. The gas is first purged of carbon dioxide and the energy-rich methane gas is sold as vehicle fuel. Liquidgas Biofuel Genesis AB (LBG AB), partly owned by NSR, is responsible for the gas purification and production. NSR produces the usual compressed biogas. Fordonsgas Sverige supplies the liquid vehicle gas from Linkoping, currently the only facility of its kind in Sweden for the production of liquid biogas. Öresundskraft aims to become a supplier of liquefied biogas produced in Skåne and is considering investing in a plant to manufacture liquid gas from biogas. 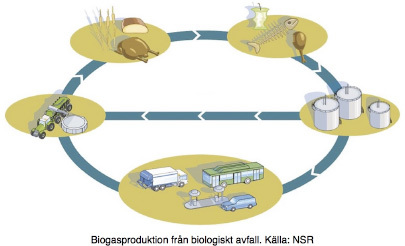 The biogas from NSR is a viable raw material, but large-scale production requires several different sources. One possible addition is liquid biogas produced from cow manure from Skåne.